Electronic Kit School. - Do you want to build yourself battery indicator level when you charging your battery in this time? 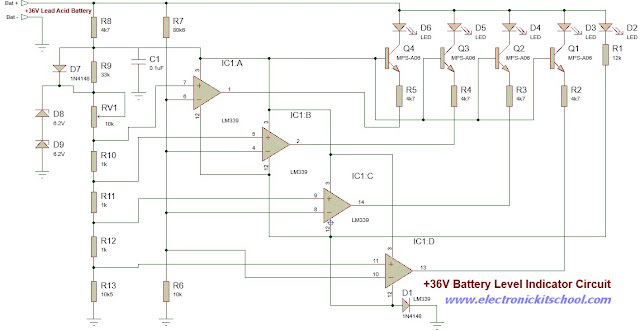 We suggest you to use LM339 IC served as the voltage comparator to do this work. As the major component, LM339 will result the voltage depending the comparison of two voltage given in pin input of this IC. We can adjust the voltage in input this IC using resistor variation. In this article we will show you one electronic circuit that will give you 5 levels from 36V battery indicator based on LM339 IC like in Figure 1 below. Circuit like in Figure 1 above show you about the 5 Levels 36V Battery Indicator Circuit using LM339 IC. From this circuit you can produce 5 levels LED indicator depending the voltage level in battery. According Electroschematics sites that also published this circuit show us that this battery level indicator offers (5) LEDs that light up progressively as the battery voltage increases. This is a update of the 24V Battery Level Indicator. While designed for 36V systems, it is easily modified to 24V, 48V or 60V simply by changing two resistors. D2 will ON, if the power connected that indicate 0% level, D3 will ON, if the voltage greater than 35V that indicate 25% level, D4 will ON, if the voltage greater than 37V that indicate 50% level, D5 will ON, if the voltage greater than 39V that indicate 75% level and D6 will ON, if the voltage greater than 41V that indicate 100% level. D9 and D8 is the voltage reference zener. Tied to this is a string of divider resistors (R10-13) that set the various fixed voltage levels. R6 & 7 form a voltage divider to that divides the battery voltage by a factor of 9. The quad comparator compares the various voltages from the two dividers. For calibration, connect to a voltage source that can be set to the highest LED threshold (41V in this case). Then adjust the calibration pot until D6 flickers. The remaining LEDs will switch on close to the indicated voltage –accuracy of those voltages may suffer slightly, but should be close. The LEDs are biased to operate at 2.3mA which is reasonably bright for high efficiency LEDs. This current can be adjusted simply by varying the emitter driver resistors (R1 through R5). To reduce standby power, a push-to-test pushbutton may be used.